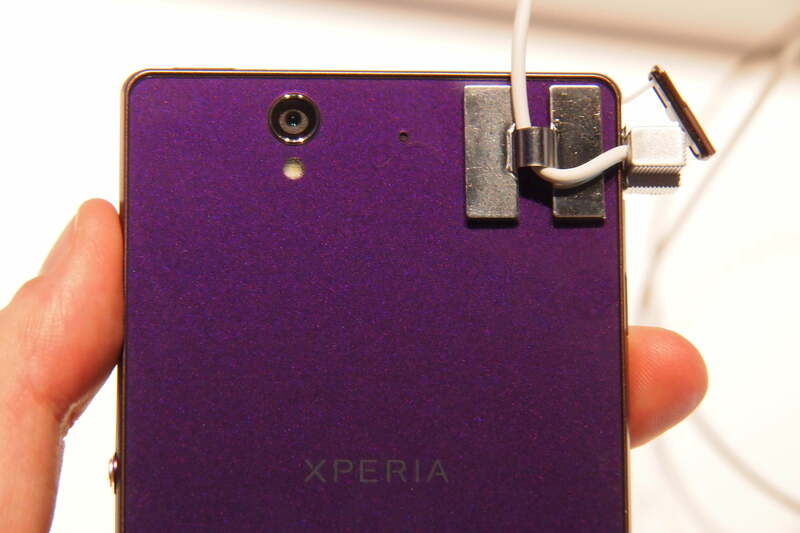 Today, Sony continued its mission to make an Xperia phone with every letter of the alphabet. 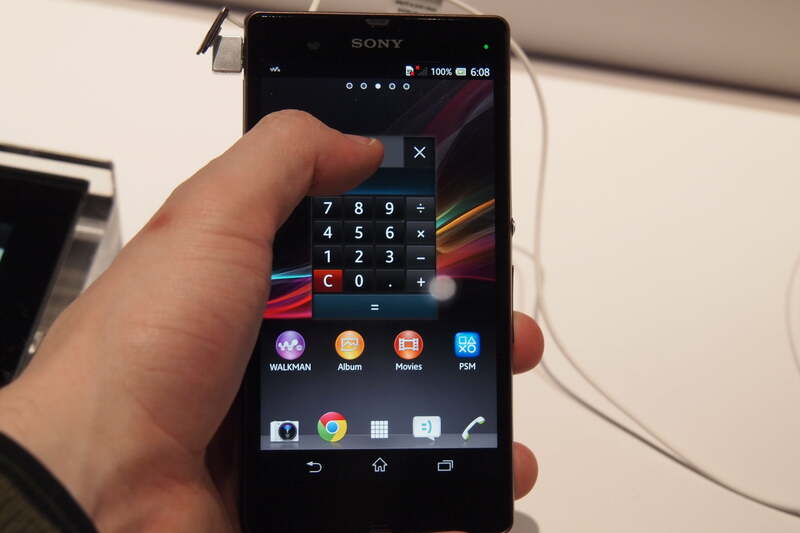 Joining the Xperia J, U, P, T(ipo), SL, and M(iro), is the new Xperia Z. 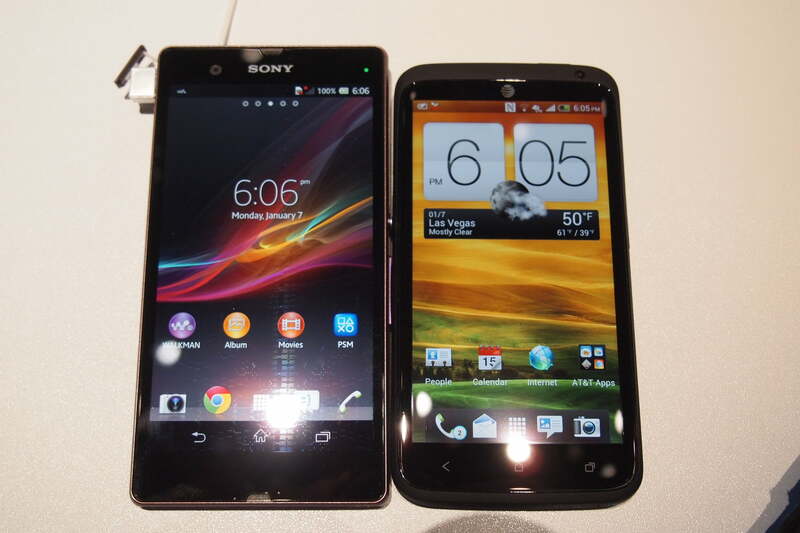 Officially unveiled yesterday at Sony’s CES press event, the Z follows all of the new trends at CES this year: it has a 5-inch 1080p screen, 2GB of RAM, 16GB (+microSD) of storage, it’s super thin, has a 13-megapixel camera, and it has a quad-core Snapdragon S4 processor. Unlike the many Xperia’s before it, the Xperia Z may mark Sony’s first chance to really stand out from the crowd and get some attention thanks to one big feature: water resistance. 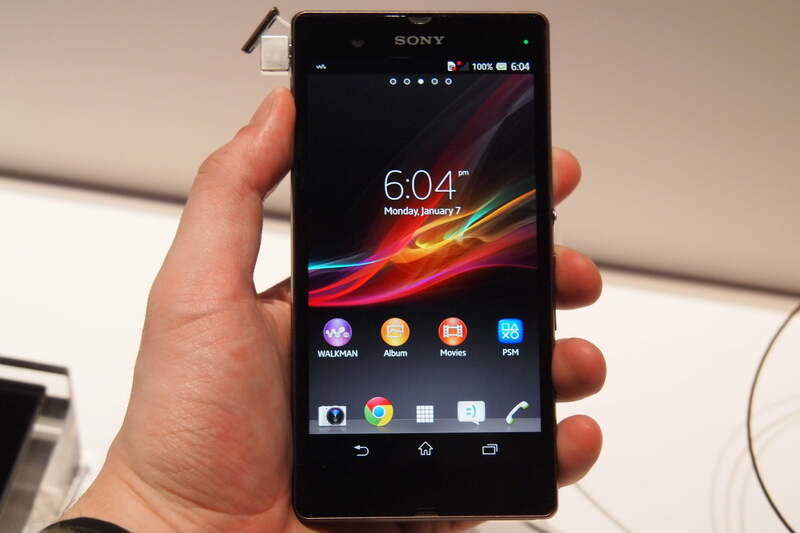 The Xperia Z may be one of the first high-end smartphones in the U.S. that you can use in the bathtub. 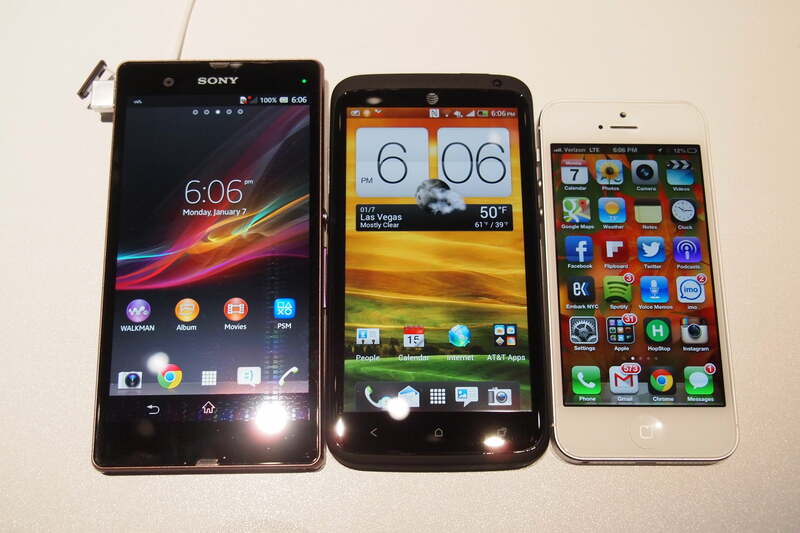 Water resistant (you can’t say “proof” anymore) phones have been sprouting up for the last two years, and you can’t walk through the CES show floor without seeing half a dozen sprays and technologies promising to waterproof our devices. These demonstrations are easy to spot – just look for fish tanks. 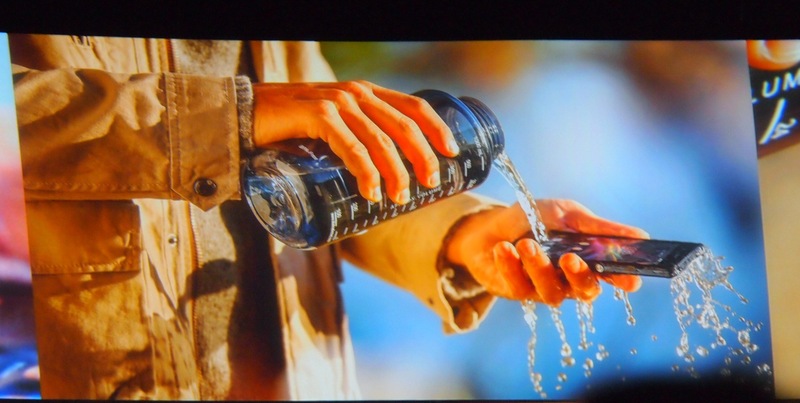 But so far, waterproof tech has mostly been relegated to gimmicky devices or phones that never hit U.S. carriers. 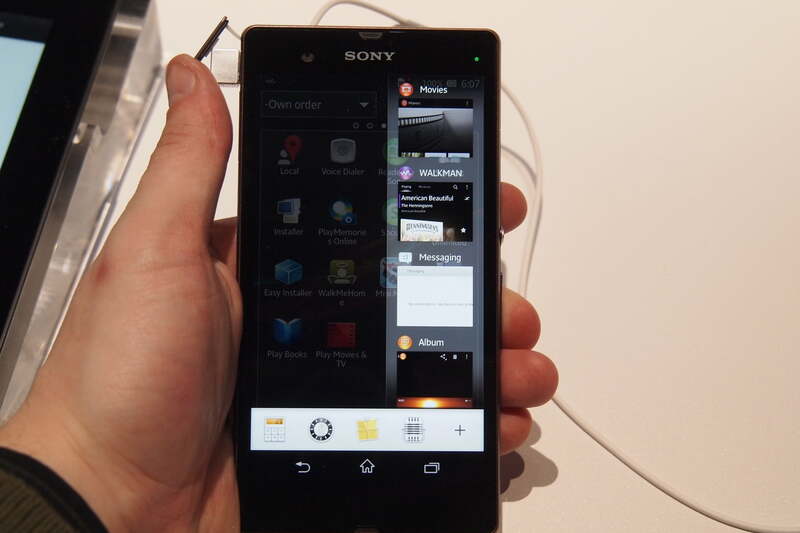 With the Xperia Z, Sony may bring this to our shores in a top-notch phone. 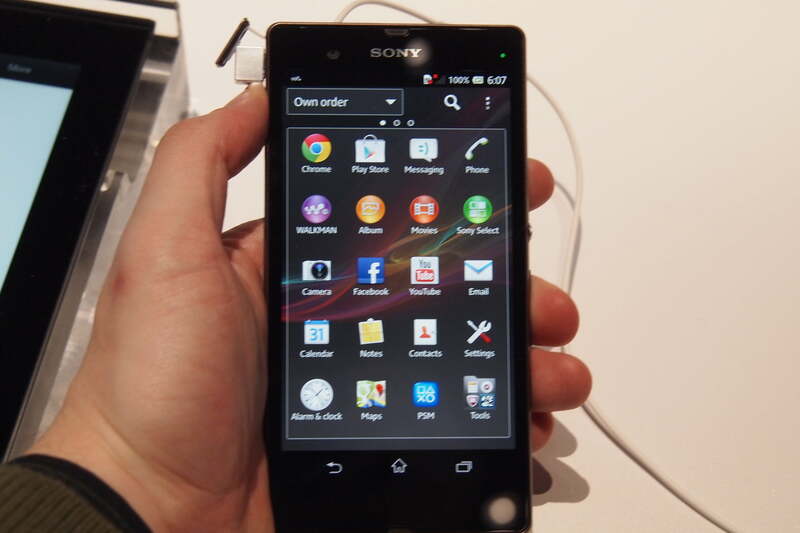 With the Xperia Z, you may be able to get a waterproof phone that also has everything else you’d expect in a 2013 device. Sony hasn’t demonstrated the water resistance, but says that you can use the Z in the bathtub and showed a picture of water being poured all over it. It looks like we may have to buy a fish tank of our own at DT to test it out. 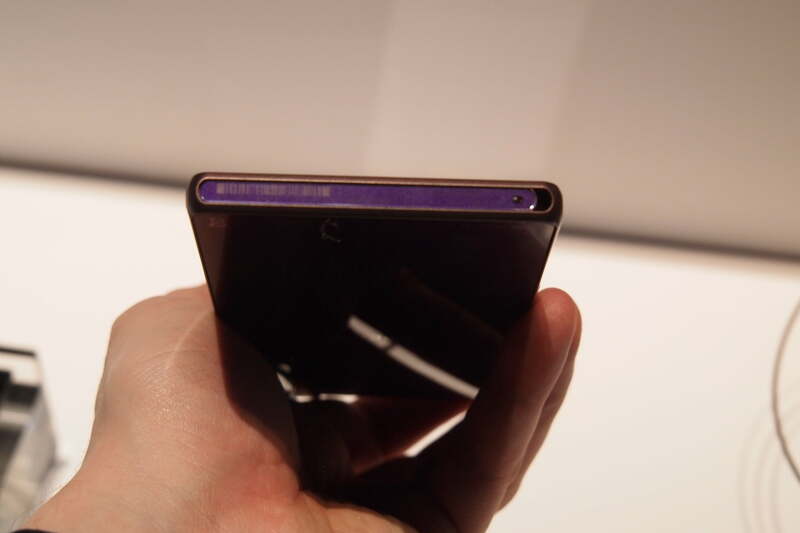 I never thought I’d hold a phone with a 5-inch screen and say it’s comfortable, but like the Droid DNA, the Xperia Z is thin enough and has a small enough bezel that most people should be able to hold it in one hand without too much difficulty. 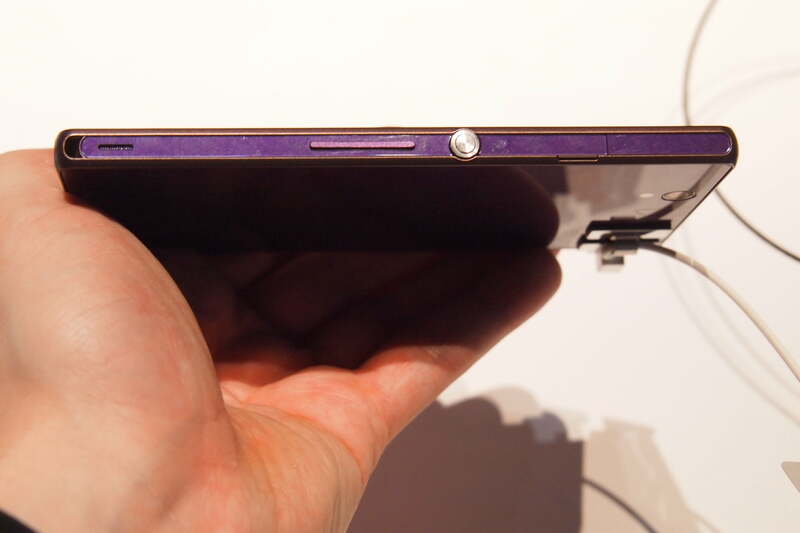 At only 7.9mm thick, it’s also the most compact Sony phone I’ve seen yet. 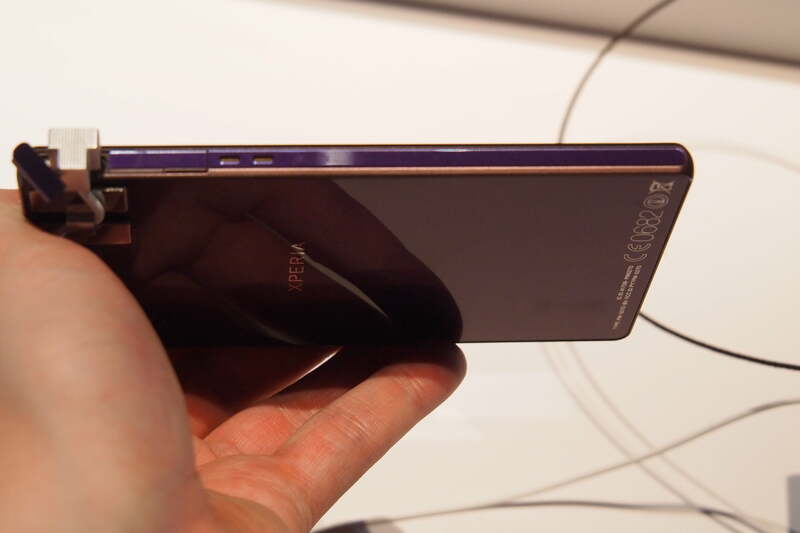 Borrowing some design cues from LG and its Optimus G (Nexus 4), it abandons the curved designs of previous Xperia phones and instead has a sparkly glass back, and comes in fancy colors – you know, like purple and white. 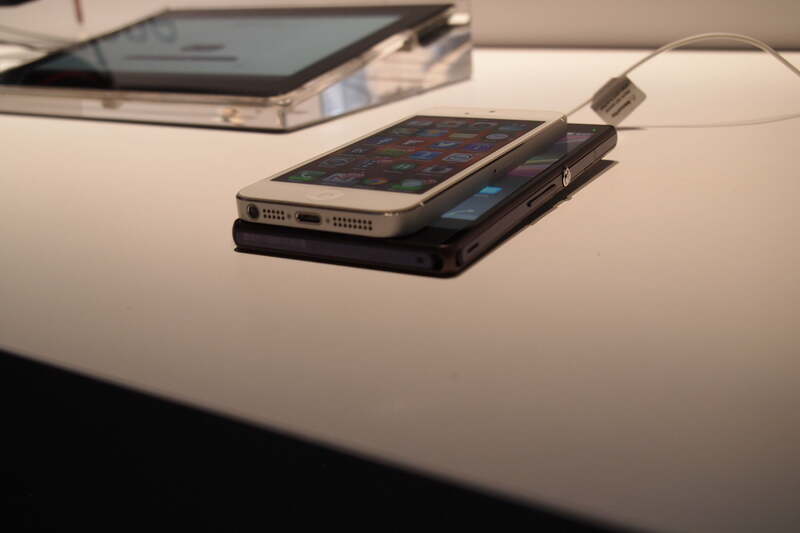 The only issue we’ve had with the design is the odd placement of the power button and volume controls. They’re on the right side of the phone, but are placed abnormally low, making them a little odd to press in some circumstances, though with a phone as big as this, there’s almost no perfect place for buttons. Sony spent a lot of time bragging about its new 13-megapixel rear camera with “Exmor RS” built in, claiming that it integrates technology from Sony’s dedicated cameras. I’m told this technology will help when you’re taking pictures at night or in dim conditions – two areas where all cameras struggle. Unfortunately, to test this feature, we’d have to steal a phone from Sony’s CES booth and, despite the devil on my shoulder begging me to make a run for it, I just couldn’t get myself to tear off with Sony’s new jewel. I’ll have to save my camera judgements for later. Either way, at 13 megapixels, you’ll be able to take some detailed photos. Sony also claims it can record video in HDR (high-dynamic range) which would be a first. I know you desperately want to play with the Xperia Z in the bathtub with your rubber ducky, but I can’t guarantee that will be an option for you. In fact, unless you’re on AT&T, it’s unlikely. Sony hasn’t announced pricing or availability. What it needs to do is get the Xperia Z on every major (or most) carrier in the U.S. Samsung is doing this with its Galaxy phones and to compete, Sony needs to build relationships with carriers outside of AT&T, where its phones have almost exclusively lived for more than half a decade. That is, when they arrive in the United States at all. 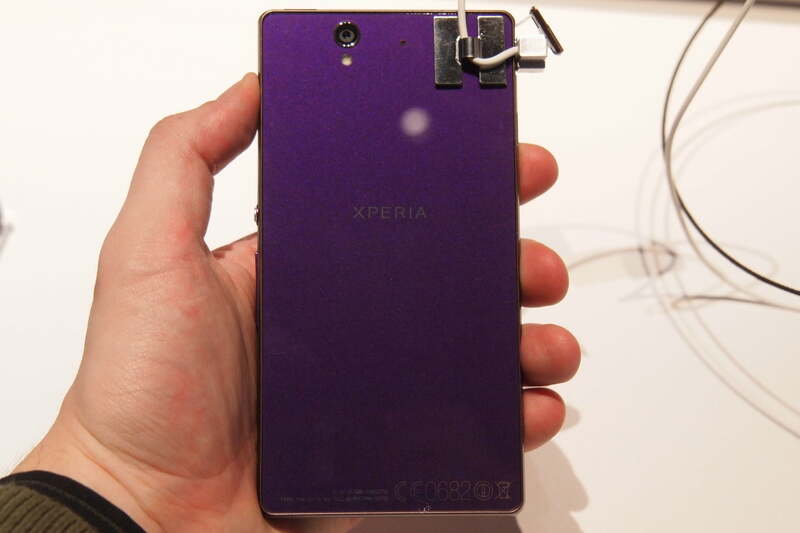 Here’s to hoping Sony will price the Xperia Z competitively and work to give everyone the opportunity to buy it here. Then, finally, you won’t have to worry about taking your phone out when its raining.